Skegness Town were beaten 1-0 at Shirebrook Town last night, in a contest overshadowed by an injury to Jacob Fenton. The Lilywhite was taken to hospital with a suspected fracture, manager Martyn Bunce connfirming the player was left with his leg in pot. Joe Cheeseman netted the only goal of the game in the second half, slotting home after a free kick was parried. 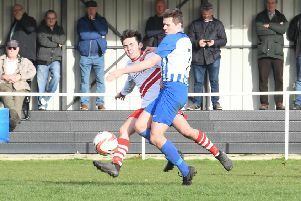 After a tough start to life in the Northern Counties East League Division One, Bunce’s side are hoping to pick up their first points when they entertain FC Bolsover on Saturday (KO 3pm).